We all know that fish are not only good eating but good for you. The benefits from Omega-3 Fatty Acids alone make it a good choice for any meal. But nutritionists say we are simply not eating enough fish. I think one of the reasons is that people just don't know how to do it right. This would really be unfortunate because fish is very easy to cook.If you catch your own I will trust that you know how to clean and filet fish. If you buy your fish remember that there is a distinct difference between fresh and frozen. The process of freezing causes cells to crystallize and break. This will change the flavor. The longer something is frozen the more the flavor will be changed. Whenever possible get fresh fish because it really does improve not only the flavor but also the texture of the fish. Ask your butcher what fish are in season and make sure that your definition of fresh is the one they are using. Technically, fish are divided into fish and shellfish. I am only discussing the non-shell kind here to keep things simple. Now this class of creatures is divided into fresh and saltwater fish. Generally, saltwater have larger bones and are therefore easier to debone. Freshwater fish can't be weighted down by heavy bones, so they have lots of little bones. From here, fish are divided into flat and round fish. Flat fish swim on their sides, along the bottom of the ocean and have both eyes on one side of their head. Round fish are more what we think of fish being like. The third distinction is fat content. Fish are either lean, moderate or high-fat fish. The table below gives you some examples. Lean fish are considered to have less than 2 1/2% fat, moderate have up to 6% fat and anything above this is in the high-fat category. When it comes to selecting fish, fresh fish should fresh smell, have firm flesh and a moist appearance. If the fish smells too fishy ask for something else. To keep fish fresh, make sure it is tightly wrapped and kept cold. Do not plan on keeping fresh fish more than a couple of days. If possible try to purchase it the same day you plan to cook it. If you can't cook the fish within about 2 days, freeze it. Frozen fish should be frozen solid and also, tightly wrapped. Finally, here are a couple of tips for cooking fish. One problem with fish is the bones. Freshwater fish have lots of little bones that can be very hard to remove. First rule: I always warn my guests about bones if I'm cooking this kind of fish. 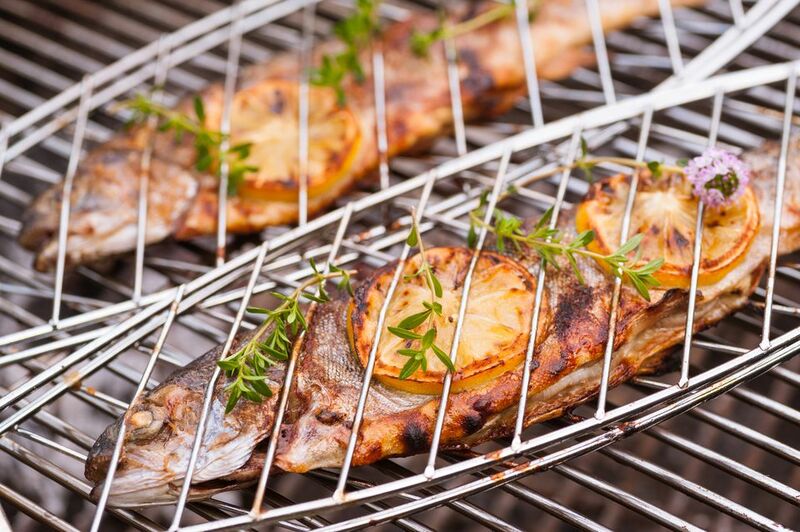 Second, it might not be a guarantee, but if you are cooking whole fish, lay them out on the grill, skin side down with the bone still in place. Be careful not to disturb the bones. Once the fish starts to cook the bones should curl up and away from the fish. It's a cool trick and it works pretty well. Once the fish is cooked, take a fork and gently run it over the surface of the inside of the fish. If you're careful and patient you should get almost all of them.